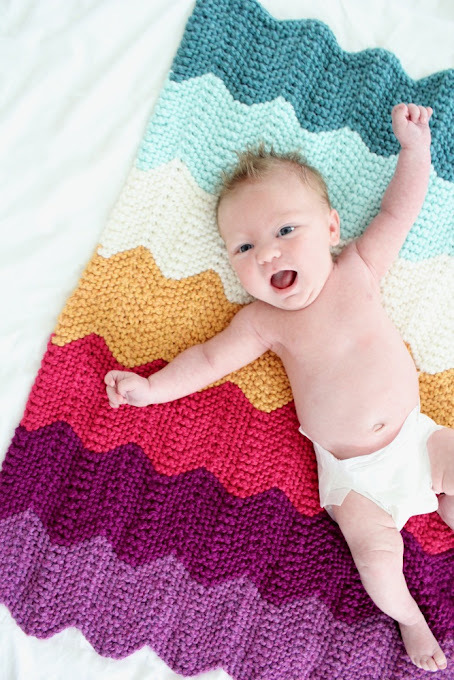 Celebrate BABY—the knitted chevron blanket. Done! Remember that knitted blanket I started forever ago? 2 weeks before Clara was born, I finished it! ….and fell in love with knitting all over again….and decided to actually add something to my ravelry notebook HERE. The funny thing is, I could have knitted the whole thing in a couple weeks (rather than 4 months). It’s a pretty small blanket. But a knitting project feels like a good book. You love it so much you don’t want it to end…..so you knit real fast and then procrastinate the last 10 rows. Are you that way too? It’s good that I took my sweet time with it though because it made me more excited for this little girl to come. Plus, what else can you do at night when you’re 9 months pregnant? Sit on the couch and keep your needles clanking. Here’s how it came together…. I used the Chevron Baby Blanket pattern from the purl bee, where everything she does is lovely. I want to live inside her blog. For reals. And I love the yarn colors she chose. But I went with girly pinks and purples instead. I bought my yarn at a cute shop on South Congress in Austin called Hill Country Weavers. They carried the pretty Blue Sky Cotton yarn on the left which is what Purl Bee used. But I went with this Berroco brand “Vintage” wool/acrylic blend on the right because it can easily be washed in the washing machine. The yarn wasn’t cheap. I spent about $70 total on the skeins (which is less than what Blue Sky Cotton would have cost). But I really wanted to go all the way with the project and not skimp on the supplies. Kind of like making a real nice quilt. You could surely use lower quality yarns but I’m not sure what to recommend there. With my yarns selected, my size 11 needles and I got busy (more info on my ravelry post). and busy. The blanket went with me on the plane a couple times, to the park, the doctor’s office, and yes the couch. I got real good at counting stitches and unraveling messed-up rows. It’s not that the pattern is hard. It’s actually quite easy (and I’m a total novice—this was my 2nd knitting project). But it’s the kind of project that you can not do while talking. It requires you to count every 10 stitches. So it’s best to knit with a movie on in the background….rather than a playdate at the park. Here’s the finished product: Molly’s blanket (left) and mine on the right. Her lines are much straighter but I’ll chalk that up to years of knitting experience. 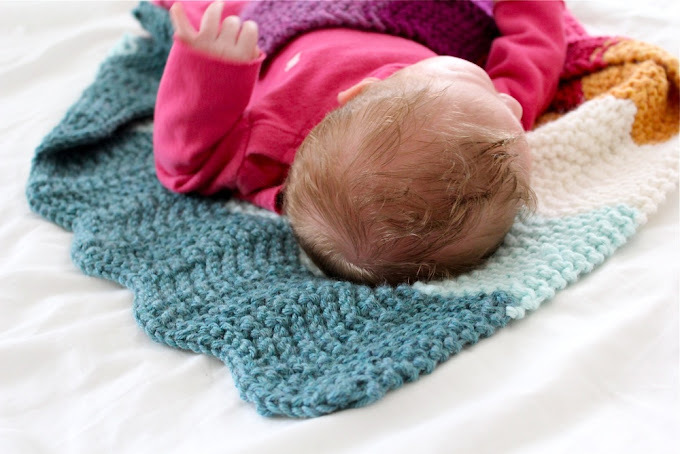 The blanket is knitted with double strands of yarn so the finished product is chunky and a good weight. I would definitely recommend it to a beginnger, if you have someone to help you get started. Or…just consult youtube.com. I’m amazed at how many wonderful how-to videos are on there (such as “how to wind a center pull ball”, which you need to do before starting this project). If you’re a professional knitter too you could easily have the blanket done a week tops. Yay for blankets and babies with similar gestation periods! And yay for my friend Katherine who helped me read the pattern and get the project started. She’s my go-to knitting expert. And when she’s not sure about something, we call her mom. It’s good to have a support system. What Kind of yarn did you go with what brand? It came out really well Dana – good for you! I always find that knitting is kind of a nice balance to sewing – I love to sew, but it’s also so nice to have a project that is so totally portable, where you really get into every single stitch. I love that. Both “projects” are just lovely!! Love this! Wish I knew how to knit. looks great! I started to crochet one when I was pregnant with my last, but it wasn’t my cup of tea!! I honestly can’t remember which colors I purchase though! Oh I am so excited to see it done. It’s really pretty. And isn’t it so fun to have a new baby AND blanket in the house. 🙂 She is absolutely adorable. This is gorgeous. 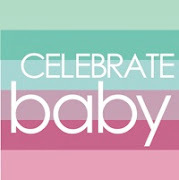 The colors are perfect and that adorable baby just makes it even more sweet. Definitely an heirloom for little Clara’s family some day! It’s beautiful!!! I’m about to start one in boy colors, but crocheting. Geez I love this. Wish I could Knit! Thats funny because I want to live in YOUR blog! Could I possibly order and purchase one from you??? Ohh it came out great! When you first posted about this you inspired me to try it. I am making up a couple for my girls. I am half way done with one. I used a chunky yarn and bigger needles because it will be for my 6 year olds. It is coming out great! I know what you mean about this pattern being easy yet needing to count to keep your place. I tried bringing this to dance lessons but we moms like to talk too much and it didn’t go well. So now I just work on it every now and then when I just fell like watching TV when the kiddos go to sleep. Thanks so much for the inspiration! Yay! This blanket is so pretty it almost makes me want to knit. Almost. I think I’m just too impatient. Beautiful blanket, beautiful baby =). I have so many books to finish, and by that, I mean projects that are almost done. One stitch at a time! What a beautiful baby (and blanket)! You’ve made me want to learn to knit. I crochet, but very rarely. I love the colors that you chose! Beautiful, Dana! That color combo is simply perfect. Congrats on your second-ever knitting project, too! Cute blanket but the baby is way cuter 🙂 I love her chub, so delicious. the blanket is gorgeous! and so is clara! Oh Dana – I would love to live with you in the purl bee blog! All the things there are lovely and yours are too. You were the impulse for me to start blogging! Was so waiting for this to make it’s debut. I really must blame you for re-igniting the knitting bug. Ever since you posted about this blanket, I have been OBSESSED! I knit one up in somewhat more boy colors. And do you know about Ravelry.com? Talk about addicting! Here’s link to my finished blanket! http://www.ravelry.com/projects/dpkknits/chevron-baby-blanket I already started one using the original colors but I am totally loving your color combo! And the sweet, sweet baby girl! Thanks for sharing! I was totally going to suggest Ravelry! This would make the favourites in a heartbeat – esp with the pics of the beautiful baby! Yay! It’s gorgeous and baby Clara is so beautiful lying on top of it. I seriously love her full head of hair. 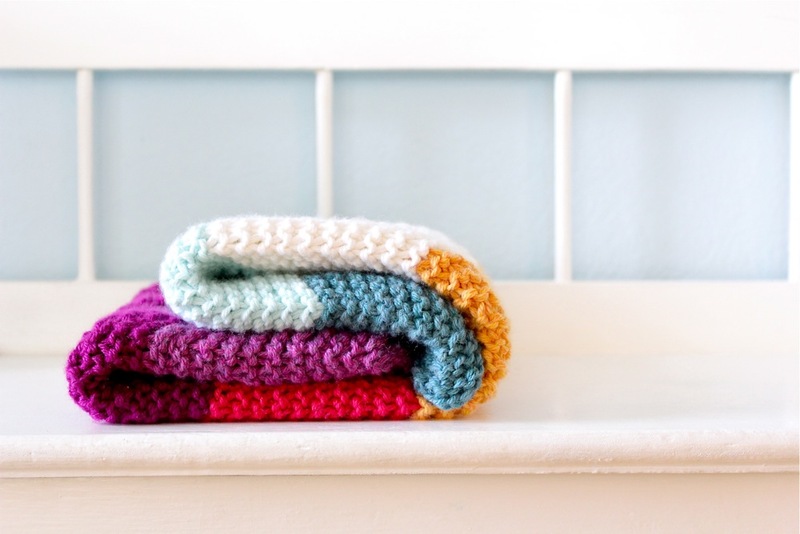 The colors of your blanket are perfect too! You really have an eye for color. This almost has me wanting to make another crocheted blanket. Almost. Blankets are my least favorite thing to make. So beautiful (and the blanket is nice too)! 🙂 I really need to learn how to knit. Love those pictures. Little Clara on that gorgeous blanket — such a treasure! I would recommend having a knitting friend help you get started though. 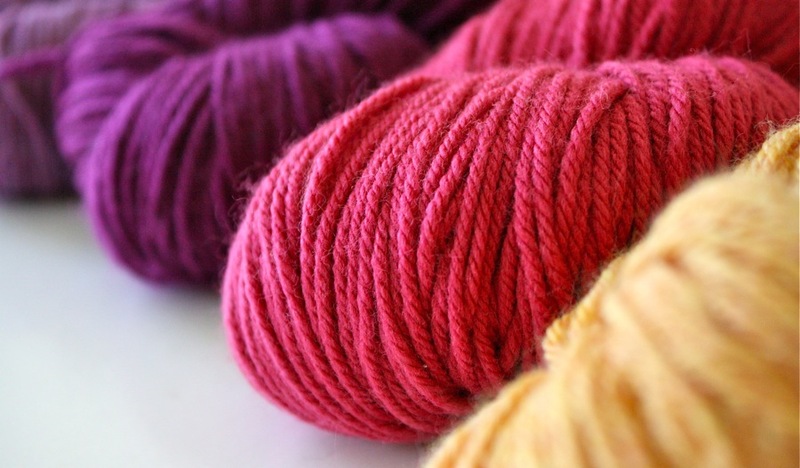 You need to wind the thread into a special ball….but the purl bee walks you through it. and I realized that anything I don’t know can be found on youtube. Seriously. Any time you’re not sure how to do something just look there and you’ll find tons of great how-to videos. It’s beautiful! I love your color picks! I love it! It turned out great. I love it!!! I need to relearn how to knit. It’s been a long time– but a chevron blanket would be so fun! Your youtube comment made me laugh. I always say you can learn anything on youtube. True Story. So proud of you! great job! It turned out just awesome! I love the colors you used too! This is great. I love the blanket. Where do you find plain white diapers? I would have loved to take pics of my kids in plain diapers but everything I have ever found always has some character on them, and those are just so distracting to the photo. I know! Target just started carrying them….it’s their generic Up and Up brand. And I, like you, have wanted it for years. It seems so pointless to have all those dumb characters on there. Oh Dana, It’s lovely! Great color choices! On my last visit to Austin my sister took me to Hill Country Weavers. Oh my. That place is dangerous! I had given up on knitting and was just going to help her pick out colors for a new project, and then whatever they pump through the AC at HCW hit and I ended up with eight skeins of Berrocco Comfort yarn in delicious colors and a Berrocco Comfort knitting + crochet book. I have loved working with that yarn! My sis got the Berrocco Vintage for some knit hats and swears they are the comfiest she has ever worn. 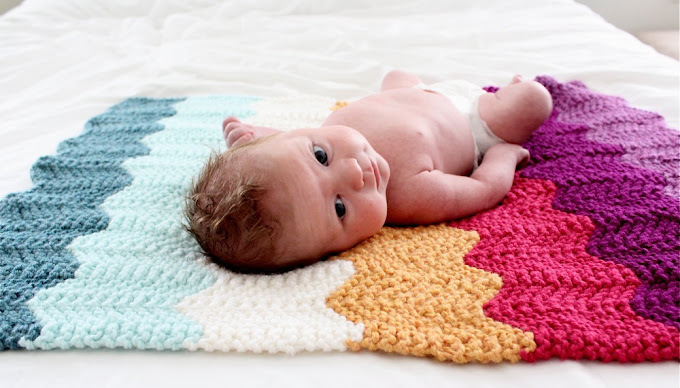 Beautiful work on the blanket and (late) congrats on your scrumptious little one! Ah I totally accomplish 95% of a project only to leave that last bit for months later. So frustrating. Though it is reassuring to know that others do it as well. The blanket is beautiful and has inspired me to pick up the knitting needles again for future babies. I adore knitting…. I tend to have several knitting projects at once going on so taking a month or year to complete one is not unusual for me 🙂 but when I do it’s the best feeling! I LOVE that blanket! You’re making me want to start knitting again! beautiful work, Dana! How beautiful! I envy your ability to knit. I can’t seem to manage two needles and the yarn all at once. So lovely! I love the purl bee – (When I can’t sleep I look through Molly’s Sketchbook and drool. Have you seen those big strawberry pillows?) and I totally want to make one of those blankets for my Clara too. But I think I’ve forgotten how to knit. Next time I’m in austin I think i’ll drag my sis there and we’ll both make one! You’ve inspired me- again. Your two “projects” are beautiful! Yay! I have seriously been in such suspense! Beautiful! I crocheted a baby blanket for Sawyer in utero and 3 years later he stll naps with it. Thanks for the ravelry info too… Will have to try! Amazing job! 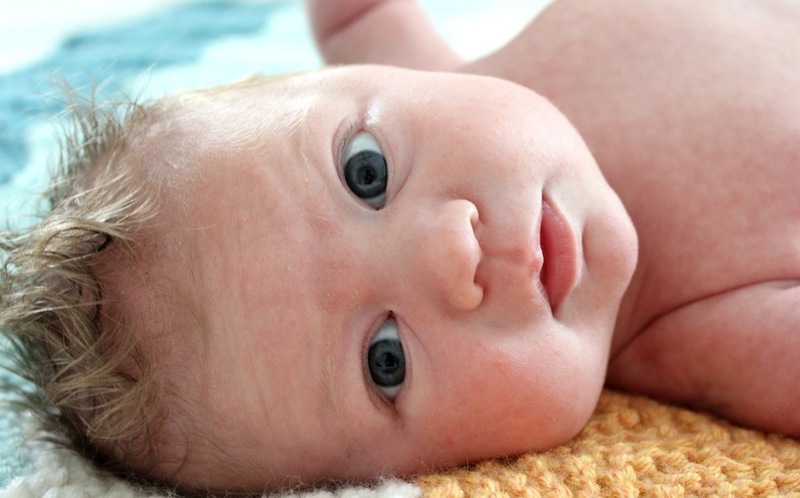 I especially the line about babies & blankets…same gestation period….haha! Love the colors and the pics with baby Clara 🙂 Precious! Oh Dana, it is gorgeous! Those colors really do work so well together and baby Clara on top doing her, ‘yay!’ has got to be my favorite!! Love it, great job! Love the color possibilities! Wow – this is beautiful! And so is little Clara!!! I love the purlbee website – I like to look at it while at work and having a bad day. Hooray! What a beautiful proejct. 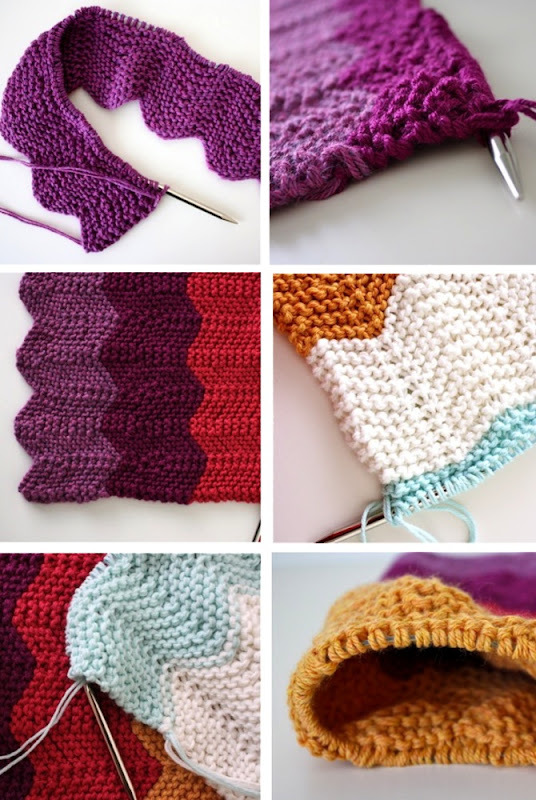 A chevron knit or crochet blanket is on my list somewhere… I’m very impressed you invested the time and finished it! I recently knit my first blanket. This seems like an awesome second blanket! I want to make this adult-sized :). it’s so pretty! i love it! and your comment about the gestation period is great. i love moms for being a knowledge back up too! i call my mom all the time about crafty stuff- she has done it all. I learned to knit when our first munchkin was only a few months old and immediately fell in love. Since then I have become completely enthralled and can not tear myself away from a yummy skein of yarn. You did a beautiful job and I look forward to your future endeavors at the great adventure in knitting….. I love the colors you chose! So bright. It looks like fun – I added it to my Ravelry queue. The blanket and the baby are both just lovely. My friend Katharine is also my go-to knitting resource. How funny!! I am going to start on a chevron blanket for our living room sometime soon and this is just so inspiring. 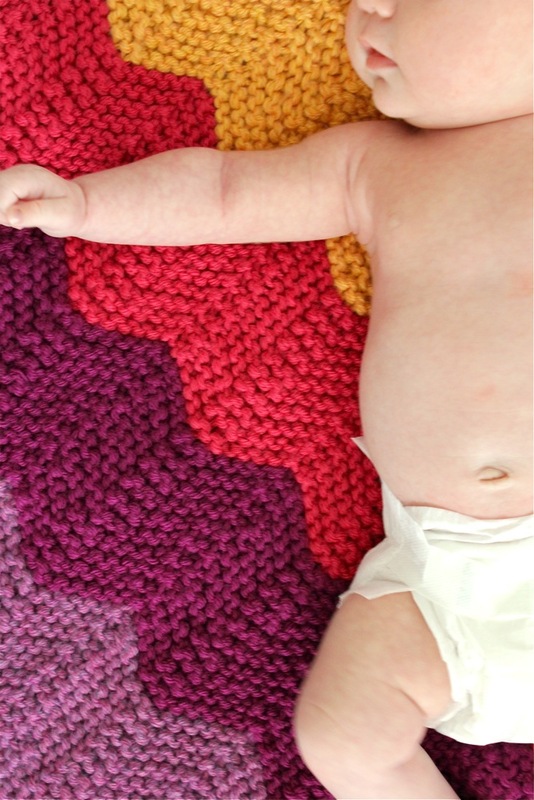 I love the excitement that comes with finishing something like a blanket or creating a baby! I, too, have been eagerly awaiting this reveal! I saw the pattern on Purl Bee when it was posted and fell in love with the blanket. Shortly afterwards I found out that my little sister was expecting her first baby. I pulled out the needles right away. I just thought I’d share that I used Naturally Caron’s Spa line for mine (blogged about here: http://sometinytidbits.blogspot.com/2012/03/chevron-love.html), and I love the way it turned out. It’s a much more affordable option – especially since you can buy it as you go and use the 40% off coupons at Hobby Lobby – and the reviews say it washes well. It’s a bamboo/acrylic blend that is lusciously soft. I needed a more affordable yarn since I doubled the size of the blanket to make it more of throw she could use on the floor to play on instead of a small stroller blanket. Oh, Dana! It turned out B-E-A-Utiful!!! I just love your color choices. I’ve been waiting to see your variation on Purl Soho’s blanket… worth the wait. We also recently welcomed a baby to our fold… our 5th child. The other children all have “special” blankets that mama made for them while I was pregnant. This Baby Girl is still missing hers! Since I too am relatively new to knitting, I think this might be a wonderful pattern to whip up as a spring blanket… perfect for throwing over when you still just need a little ‘sumpin’ extra! 🙂 Thanks for posting! oh my gosh i love it and i love the colors!!! this is lovely! such pretty colours too. The blanket is gorgeous! I really love the colors you chose! I was also going to suggest blocking it to straighten out the lines and sharpen the points. It’s beautiful as is, of course but blocking would make it more crisp. Congrats on the little one and the blanket! Absolutely gorgeous!! Love all the colors! Dana! I LOVE it!!! I would do this if I was right-handed. But I’m left-handed and i tried to knit, but it’s hard for me. But when I saw your blanked i though that I’ll try once more. But I’ll do it in adult’s size (or child’s too – my aunt is going to have a baby boy). And tell me something. Is Clara’s hair became brighter? So it seems to me. Nice 2nd project! The lines could be due to blocking if you didn’t do that. I usually leave blocking to it’s first wash for a project like this. Although, if you took it lots of places, sometimes it’s nice to give it a first wash right away. Blocking can fix lots of things. (Kind of like pressing when sewing). I would learn how to knit just for this cutie. Yours turned out beautifully! how gorgeous! 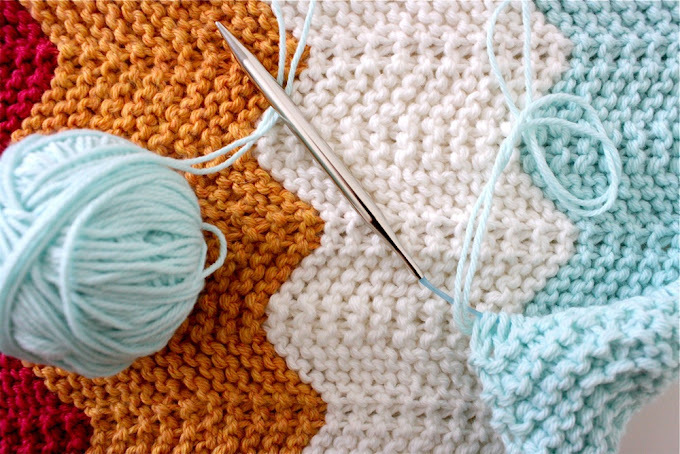 im working on the same blanket except im crocheting it!! 🙂 hope it turns out cute like yours!! What a gorgeous blanket for a equally gorgeous little girl. 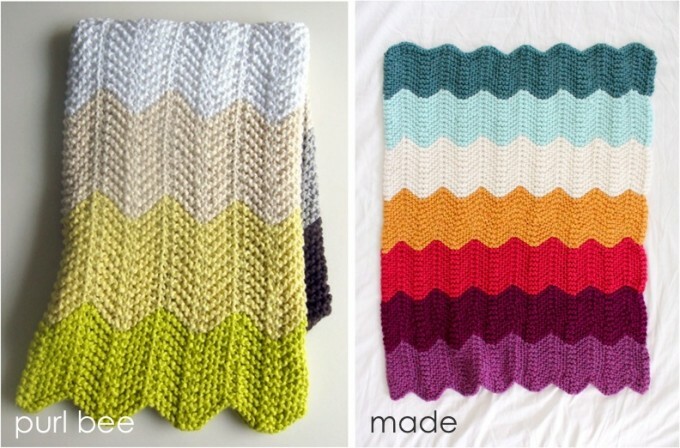 I love this blanket and am going to see if I can make one for my friend due in June. Thank you so much for sharing! Oh my gosh Dana. Yeah, the blanket is cute, but little Clara is ADORABLE!!! I just want to kiss those cheeks. She looks like such a Willard. Nice work, you too :). I just cast this on last night and I am hoping to have it done for my little ones first bday next week 🙂 Thank you for the review, I am loving it so far. I’m crocheted a chevron blanket but knitting is my first love, so I’m REALLY excited about this pattern! You did a lovely job! So neat! I’m more of a crocheter than knitter, but it’s all the same kind of craft 🙂 I’ve added you as a friend on Ravelry, I hope that’s ok! Ok…I love this! GREAT job too….I’ve done chevron once or twice and just didn’t care for it, but I think you may have inspired me to try this! Great little lap blanket for great grands I’m thinking!! I have a ton of Mano’s Del Uruguay Cotton that I bought when they were discontinuing it..thinking this is the project for it! PS…love your choice of yarn. The vintage is such a nice yarn, easy to wash and so soft. I love BSA Cotton, but it is a bit on the high end, but so worth it for a nice project. I use it when making little lovey toys for my kids. So soft and the colors are wonderful. If your wanting to knit something new..try some toys! Susan B. Anderson she has some fabulous patterns, I LOVE this one for babies..http://www.ravelry.com/patterns/library/bunny-12 and this guy.. he is my favorite of all time. I made him out of BSA Cotton and he is amazing. Happy KNITTING!! Thanks for inspiring my sewing and getting me onto a new knitting project. Your awesome! Love this!!! I saw this pattern over at purl bee and am going to knit it for my friend’s baby. Love the colours you used. I am glad to hear its not as hard as it appears to be as I am relatively new to knitting as well. My grandmother used to make these! Before she died, she made a white one for me and gave it to my mother to give to me when my first child was born. I’m so glad to find the pattern! Thank you! How soft is the yarn you used? Can you also do this with crocheting instead? Did I miss something or where are the instructions? How would I make this larger? The baby loves it!… It felt comfort and warm. 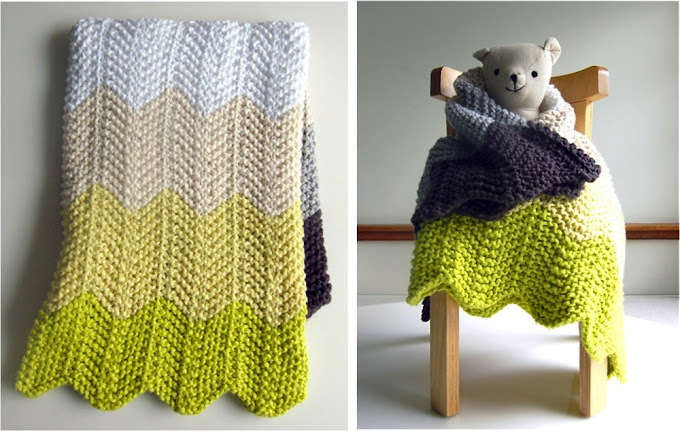 I LOVE this blanket–it actually inspired me to start knitting a few years ago! Now that I am expecting a baby and a little more seasoned knitter I am ready to try it! 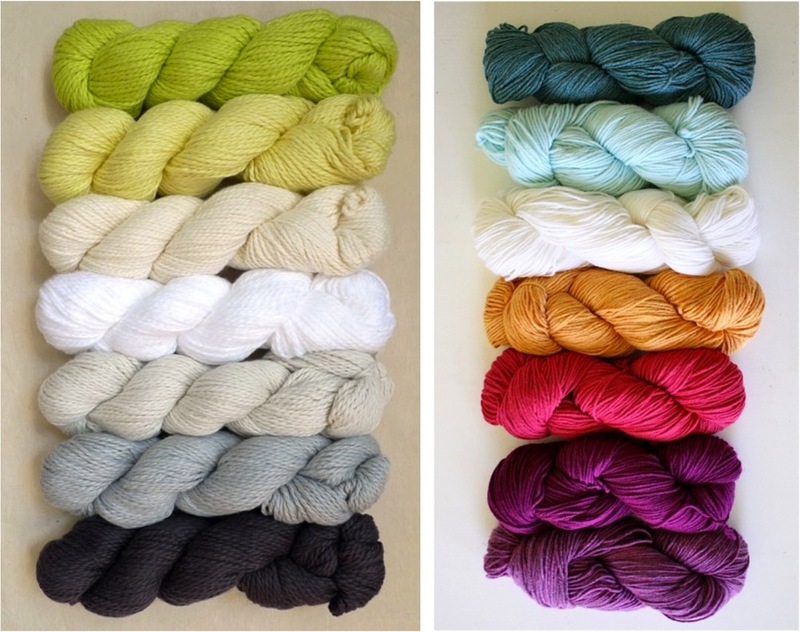 I have some beautiful yarn that is very very bulky and is recommended to use size 19 needles. Do you know how I would adjust the pattern for bigger needles? Would I still double up yarn even though it’s extra bulky? Thanks!